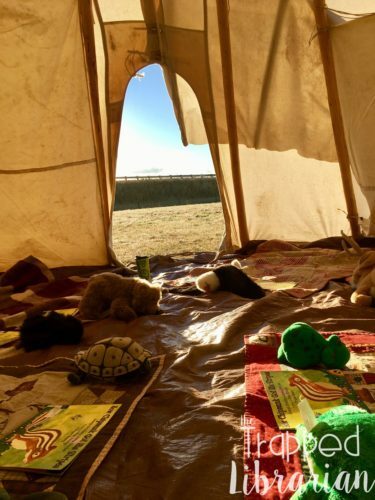 You are here: Home / Library Events / Teach in a Tipi for an Engaging Learning Experience! Recently I collaborated with the music and physical education teachers in my school to provide an interdisciplinary unit around the theme of Native American Culture. (Yes, these are the same friends who had the great idea to team up for an Irish Unit Collaboration around St. Patrick’s Day!) In Montana, we celebrate American Indian Heritage Week the last full week of September. There is a powwow in our community on the weekend that several of our students attend and participate in. This is the perfect week for our collaborative unit! We began each class session in the gym with 3 classes. Our gym teacher uses dots for each student’s place, so we could easily mix up our classes in order for the students to interact with a different group of their peers than usual. After a brief introduction, we divided into three groups. One group went upstairs to the music room to learn about traditional and contemporary Native American music and dances. One group stayed in the gym to play traditional Native American games. 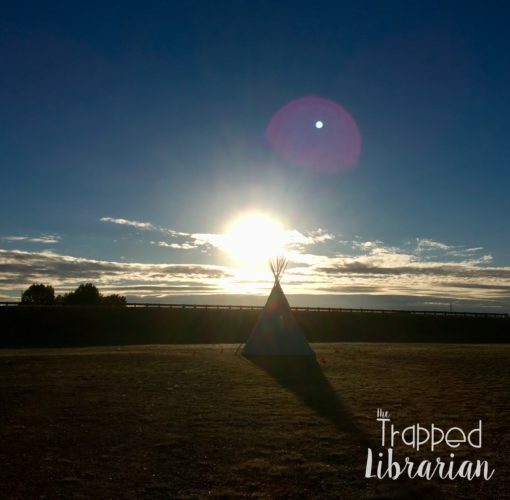 The last group came with me outside to a tipi for library-related activities. Since our class period is usually 30 minutes, we had to rotate every 10 minutes! 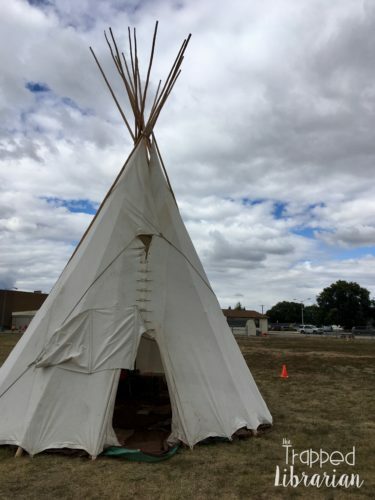 Our school district has an authentic tipi that we have set up on our playground for the week. A high school class has learned how to set up a tipi and they do the set-up and take-down for us. 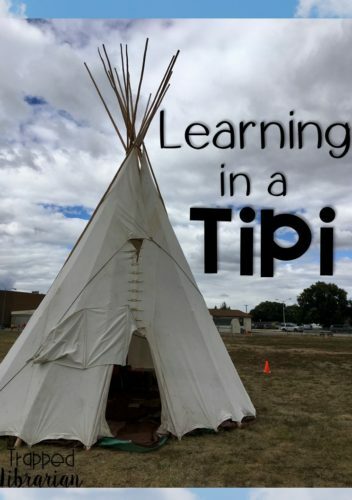 Tipi Facts: We learned that the tipi always faces east, you can spell it tipi or teepee, it was usually made from lodge pole pine poles and buffalo hide, it was a traveling home put up by women, and any paintings on the walls represented the family, clan, or tribe that lived there. Tribes of Montana: We learned their names, looked at their flags, and found the locations of their reservations on a map. Native American Regalia: We were fortunate to have examples of a real jingle dress, moccasins, and some fancy shawls. Folk Tales and Legends: We read the story How Chipmunk Got His Stripes and acted it out with realistic animal puppets. We discussed the lessons taught in the story, meant for people of all ages. 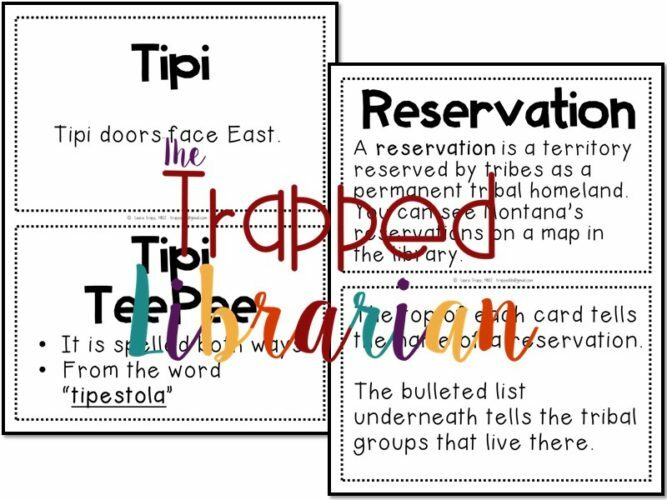 Book Tasting: I have a large collection of nonfiction and fiction books that have to do with Native American people and their culture and stories. 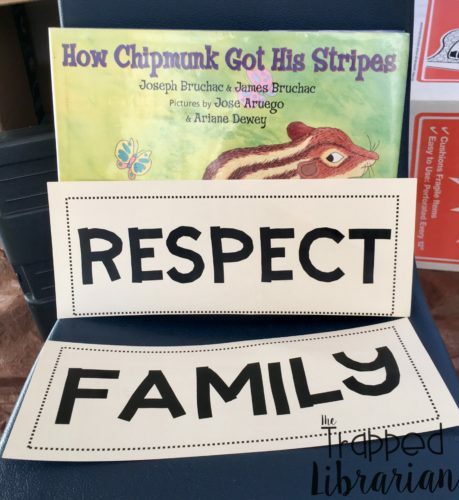 I brought a variety to the tipi and everyone had a chance to sample a few and to compare fiction and nonfiction books. We were fortunate to have a drum group and hoop dancers from the Wind River Reservation in Wyoming perform for us at an assembly toward the end of the week. They even invited all the students to join in and dance with them at the end! We kept our book and flag displays up in the library so students could explore further and find related resources easily. We hung up posters throughout the school that we borrowed from our Office of Public Instruction around the theme of “Honor Your Self.” Our OPI also gave us a poster set called “Have You Ever Seen a Real Indian?” with photographs of Native Americans of all ages with a bit of information on each about their name, career, and tribe. You can learn more about our unit by watching this clip and reading this news report from our local television station! 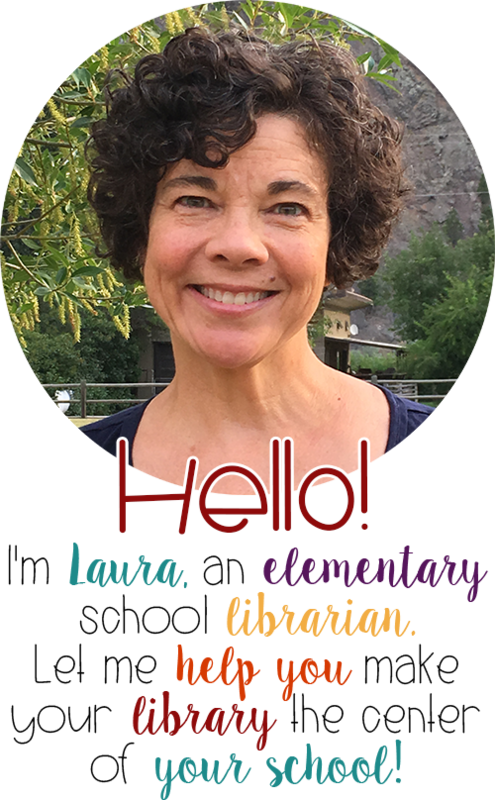 If you live in a state like Montana where it is mandated by law to teach about Native American culture and history, this would be a fun way to deliver the content required in an engaging way that students are likely to remember. To get started, I recommend you contact your state’s department of education for recommended resources. Who knows, you may find that they will provide information and resources free of charge like our OPI does! FREE TIPI & TRIBE CARDS! 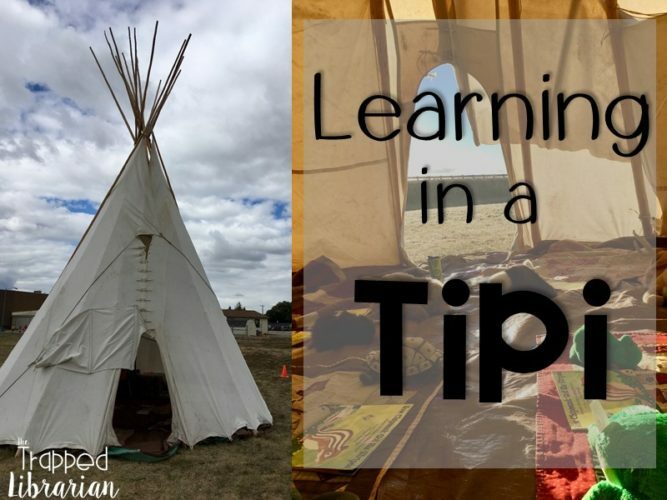 If you teach in Montana, or would like to teach your students about tipis and Native American tribes, I’d like to share the cards I used to help keep me on track during our learning. Click below for this free resource! Do you have a creative way to provide educational experiences for your students as a collaborative team? Please share your great ideas with us! Thus is such a great idea. Ty for sharing.